Updated Thursday January 24, 2019 by First Colony Little League. The 2019 Spring Season registration deadline is Thursday, January 24th. 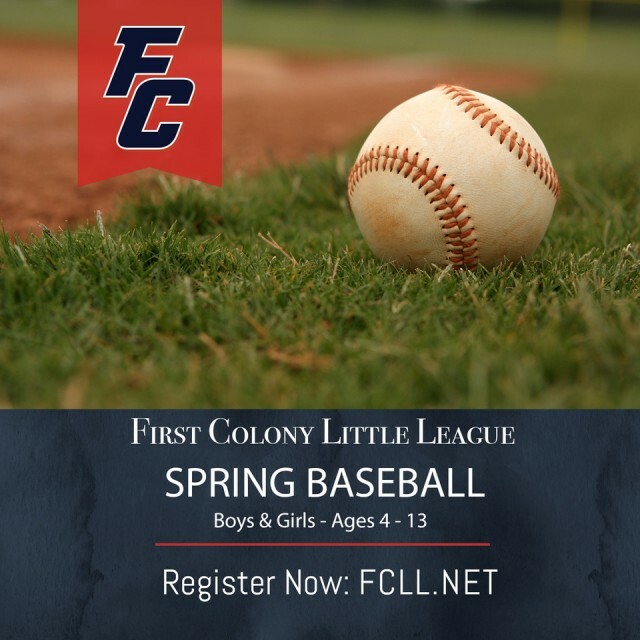 Sign up now to avoid missing out on another great season at FCLL! Any parents that would like their child to play up in a higher division than their current age group are REQUIRED to attend both evaluations for their current and higher division. No exceptions. Please arrive 15 mintues prior to the schedule time to allow us to get everyone checked in and lined up for the evaluation process. Players will need to bring a glove, bat (USA BASEBALL STAMP) and a helmet. Parents, should your child not have an aprroved little league bat or helmet, you will be able to borrow one. Please refrain from buying any equipment so we can answer any questions you might have. Also we will be having our discount day (20% off) at the Sugar Land Academy (in the Lowe's shopping center) on February 2nd. I would suggest waiting until then to purchase baseball related items. Please see attached flyer. Lastly, we would prefer baseball attire minus the jersey portion (t-shirt is adequate) for the evaluation process.